What's the Best Indestructible Dog Bed? 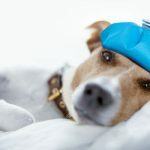 You want your dog to be comfortable when they lay down to sleep, but if your dog is a heavy chewer, you know how difficult of a struggle this can be. 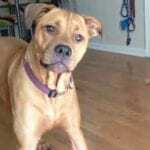 This can send you searching for the best chew proof dog bed available to try and solve the problem of your dog shredding their bed. There are dozens of different brands and types of chew proof dog beds available, and this can make it very difficult to find one to suit your circumstances. 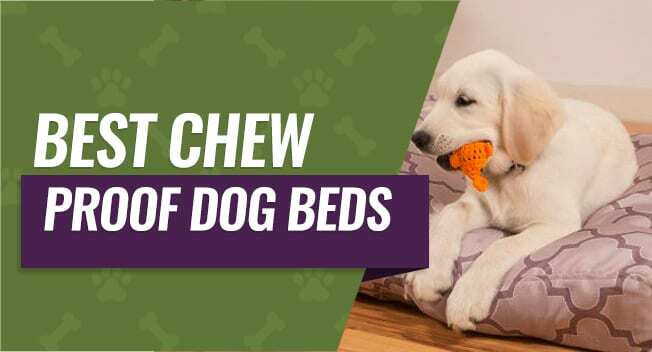 We've rounded up the top five chew proof beds available, and we've also put together a buyer's guide, so you know precisely what to look for in your new dog bed. Dogs chew for a variety of reasons, and this includes things like anxiety, boredom, or just because they like to chew. This presents a unique challenge for pet parents who want to balance giving their dog a comfortable bed but having it durable enough to withstand their dog's destructive behaviors. Manufacturers typically use the terms chew proof and indestructible bed interchangeably, and it simply means that the dog bed is made out of more durable materials than a traditional bed. This tough material usually focuses on the outer material or framework if the bed has one, while the inner material can be plush or soft because it's protected by the chew proof or indestructible cover. However, other people find that a non-traditional bed that looks like a slightly raised platform with a durable mesh material stretched across is better suited for dogs who like to chew. They don't have to worry about their dogs shredding anything or making a mess because there is no filling. The first hurdle that any pet parent with a dog that likes to chew has to decide on is what type of outer covering or fabric they want to cover the bed. There are a few different possibilities available. 1680D Ballistic Nylon - Ballistic Nylon is one of the more durable materials that you can purchase as a dog bed covering. It's similar to the material that high-quality backpacks are made out of, and it withstands moderate chewing or wear and tear very well. Canvas - Canvas material is slightly more rough than the Ballistic Nylon, but it's a good choice because many dogs don't have an interest in chewing on it. It's also good for outdoor use as well as indoor. Denim - Denim is the same material that your jeans are made out of, and it's made to withstand a lot of use or chewing without tearing, ripping, or wearing out. 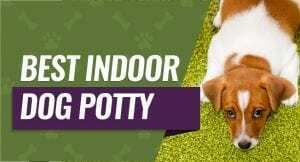 It's also not something that your dog normally chews on so this can add to its durability. Microfiber - Microfiber should be a last resort because it is a very soft material that is easy to chew through or tear. It may feel nice and soft for your dog to lay on, but it'll be difficult for them to resist chewing on it as well. When you've decided on a cover that is an excellent choice for your dog, it's time to move on to the filling. You want something that is plush enough that your dog is comfortable laying on, but it should also be firm enough to offer support and hold a shape. Four to six inches of filling is usually enough to ensure that your dog is comfortable, and filling materials like microfiber, polyester blend, or memory foam are all good choices. You'll usually pay more for a dog bed that is filled with memory foam though because it can help to reduce your dog's pressure points and takes the stress off of their joints. You can start to look at the smaller parts of your dog bed once you've decided on a cover material, and what type of filling you want along with how thick you want it to be. Each of these smaller things can help to improve the longevity of the bed. Bacteria and germs can thrive on a dog bed, especially if your dog chews and regularly coats the bed with their saliva. The dog bed should have some form of antimicrobial properties to help ensure that the bacteria levels stay low and that the bed doesn't trap and hold in odors. If you have a budget that you're working with, this may restrict what beds are available to you right from the start because these beds can range from around $40 up to well over $100 for a single bed. 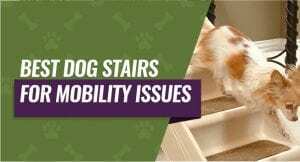 These dogs beds are usually made of higher-quality materials, and this can cause them to cost more, and this can put an unwanted stain on your budget if your dog chews through it quickly. Take a good look at the dog beds that you're considering buying and pay close attention to the corners, seams, and any zippered openings because these are areas that are prone to wearing out or breaking down quickly. Ideally, you'd like to see reinforced corners, double stitching on the seams, and a reinforced zipper area to help ensure that the bed lasts for a long time. Ideally, your dog bed should come with a removable cover that is resistant to bacteria and odors because this makes it easier for you to keep the bed clean between washes. You want to be able to wipe it down with a damp towel and toss it into the washing machine for a deeper clean a few times a month without worrying about it falling apart or ripping. Your dog bed should be larger than the dog that is going to use it so they can nestle down and feel secure. You can get chew proof dog beds starting in small sizes and ranging up to extra-extra-large, so you do want to have a good idea of the size of your dog before you buy a bed. Some dogs like to feel like they're sheltered when they sleep, and beds with raised sides can help to mimic this feeling. There are several different styles available for these durable dog beds, and you can buy raised platforms, plush pillows with flat edges, lounge-style beds with walls, and crate beds with a more uniform design. If your dog is a very rigorous chewer, you want to ensure that the dog bed you pick out is covered by some type of warranty so you can get a replacement. As we mentioned, this can be a more costly investment, so look for a dog bed with at least a 90-day warranty if not longer. No matter how well-trained your dog is, having a waterproof layer that protects the dog bed's inner filling is critical. Make sure that whatever bed you buy offers this feature, and it should be concentrated on the outer layer or covering to help ensure that cleanup is quick and easy. This durable raised dog bed comes in four different color options and five sizes ranging from mini to extra-extra large so you can customize it to fit your dog's size. You can also choose from a few different durable frame types ranging from aluminum, walnut, and almond for outdoor and indoor use. The Cordura material that the platform is a durable and waterproof material that is resistant to everyday wear and tear like digging, nesting, biting, and chewing. The raised nature of this bed can help to keep your dog cool, dry, and comfortable whether they're laying on it inside or outside. Pet parents liked that this chew resistant dog bed came with an elevated design and a one-year warranty against damage or defects. They didn't like that this bed isn't as soft as other choices or that the material tended to wear out in the middle of the bed. You get to pick from seven different color and pattern options and five different sizes ranging from small up to extra-extra large. The Ripstop Ballistic Material resists chewing, odors, wear and tear, digging, nesting, and general use while being easy to clean and maintain by simply wiping it down with a damp rag. The channeled polyester mattress is designed to be fluffy and lightweight but durable enough to resist clumping, sinking, odors, and moisture buildup. You get a 90-day warranty against chewing, and you can use this bed both inside and outside without running into any problems. Pet parents who bought this dog bed liked that it came with the warranty against chewing, and they liked that the outer cover was easy to clean and maintain. They didn't like that the warranty only covers one replacement bed cover or that the bed is over $100 to buy it. This bed comes in six color choices and six sizes ranging from medium up to jumbo so you can find the right fit for your dog to be comfortable. It has two layers of protection including a waterproof casing for the interior and a durable ballistic nylon fabric outer layer that is resistant to chewing and tearing. Your dog will enjoy six inches of padding with this bed, and it is a shredded memory foam insert that is designed to cushion your dog as they lay on it. It zips closed with a waterproof zipper, and you can take the cover off and toss it into the wash quickly and easily to clean it. Pet parents who bought this dog bed liked that it came with a durable but soft to the touch ballistic-grade cover that was machine washable and that it was stuffed with shredded memory foam. They didn't like that the cover showed a lot of dog fur right away or that the memory foam tends to flatten out in places where the dogs lay. This pet bed comes in 10 different patterns and styles, and you can choose to buy just the durable cover or the entire dog bed when you order it. This bed has slightly raised sides that are designed to cradle your dog as they lay down, and the cover is made of a durable nylon mix that is chew resistant. You're able to slip the cover on and off to wash it with the secure zipper closure, and it features very few seams to add to the overall durability. The bed is stuffed with soft microfiber that is safe for your dog, and it'll hold its shape with repeated use or as your dog digs. Pet parents who bought this bed liked that they could buy just the cover or the entire bed and cover combination, and they liked that the cover is machine washable. They didn't like that the colors were much brighter than it was advertised and that the zipper tended to break after a few months. This dog bed is designed to fit in a variety of crates from small up to extra large and give your dog four inches of padding, so they stay comfortable. The high-quality foam is made in the United States, and it is designed to retain its shape over time. The foam is an orthopedic grade, and this means that it's an excellent choice for older dogs or dogs with arthritis or joint problems because it helps to reduce pressure points. The cover is tan, and it's rated as being very resistant to chewing, nesting, digging, or general wear and tear. Pet parents who bought this crate pad liked that it came in several different sizes and that it gives four inches of orthopedic grade padding to reduce pressure points. They didn't like that it wasn't completely waterproof, and it tended to leak at the seams when you try to wash it. Our pick for the best chew proof dog bed is the Kuranda Elevated Chewproof Dog Bed because it has a design made specifically for aggressive chewers. The Cordura material is durable, waterproof and resistant to nesting, chewing, digging, and everyday wear and tear. We also liked that it has an elevated design so air can get underneath it on those hot summer days and includes a one-year warranty. With that said due to the design it isn't as soft as the other beds but it is extremely durable.